...that Vex machinery is thought to exist within every planet of the Solar System? ...that Quria trapped the Dreaming City's Taken corruption in a 3-week time-loop following the killing of Riven? ...that prior to Destiny's launch, a prototype of the Vestian Outpost was briefly shown in a trailer? ...that Bungie acknowledged the Destiny leaks in November 2012? "Such courage and power—the greatest ever to grace these worlds. You bring all of us peace, we will light the final flare, Devil Red. They will all know what you've done." 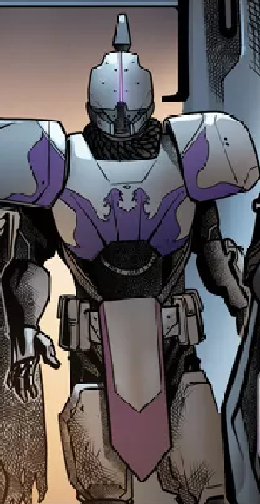 Saint-14 was an Exo and one of the most famous Titans in the history of The Last City. He served as the first Titan Vanguard and was the right hand of the Speaker. After the exile of Osiris and Saint-14's crusades against the Fallen, Saint-14 disappeared on a mission to Mercury to prevent Osiris from disturbing the Vex. "The Devil Kell Solkis... is dead. This war is over." At some point, Saint-14 was given the weapon Perfect Paradox by a Guardian - possibly time-displaced - who served as the role model who inspired Saint to become the legend that he is. During the Battle of Six Fronts, Saint-14 fought against the Fallen's attempted assault on the Last City. He later claimed that he was inspired to fight and keep the City safe by a vision of a savior Guardian who would one day arrive to aid humanity. The Guardian's Ghost at one point befriended Saint-14 while searching for a partner. After the destruction of the Iron Lords, Saint-14 was one of several Guardians who attempted to keep order in the Last City as chaos threatened to reign. Under the guidance of the Speaker, he helped to established the Consensus and Vanguard, serving as the first Titan Vanguard. Alongside him was Tallulah Fairwind as the first Hunter Vanguard, while he recommended that his friend Osiris serve as the first Warlock Vanguard and Vanguard Commander based on his leadership and actions during the Battle of Six Fronts. Following the murder of Nian Ruo and several other Guardians at the hands of Taniks, the Scarred, Saint-14 was dispatched by the Speaker and Osiris to eliminate the deadly Fallen mercenary. Saint-14 failed to track down Taniks, but the Hunter Cayde-6, a comrade of Nian's, located him instead and was believed to have killed Taniks, although it was later revealed that the resilient Fallen had survived the encounter. In the aftermath of the Battle of the Twilight Gap, Saint-14 hunted down Solkis, Kell of the House of Devils, whom was one of the instigators of the Fallen's attempted assault on the Last City. The two fought a fierce battle, with Saint-14 expending most of his Light during their fight. He managed to defeat the Kell by gathering his remaining Light into a headbutt, using the horn of his helm to pierce Solkis' head. He had his Ghost confirm the Kell was dead, weary of the powerful Kell's strength. Relieved that he had ended the threat of the House of Devils for the moment, he contacted the Speaker and informed him of his victory. The Speaker praised his adopted son and declared him the greatest Guardian of the City and that all would know of his deeds. Saint-14 informed him that he would need time to recover before returning, and after noticing concern in the Speaker's tone inquired what was wrong. The Speaker informed the Exo that Osiris was on Mercury in the Caloris Basin, alarming Saint-14, who believed that such actions would provoke the Vex and threaten their newly hard-won peace. Vowing to stop his former comrade, Saint-14 ordered his Ghost to prepare his Vex arsenal and prepare for travel to Mercury. Saint-14 would later attempt to track Osiris on Mercury, where his trail leads to him getting lost in the virtual expanse of the Infinite Forest. The Titan faced the Vex for several centuries, destroying thousands of them. Eventually, the Vex created an Axis Mind created specifically to drain his Light. Though he felled the Mind, it succeeded in its mission, mortally wounding the legendary Titan and draining his Light. His last act was to take measures to ensure that Perfect Paradox would one day return to the one that originally gave it to him. Out of an approximation of respect, the Vex laid Saint's body to rest in a tomb in a Simulant Future, surrounded by the melted shells of all the Vex he killed as a memorial to the grief he gave them. Saint-14 had theorized that the Darkness was an army of aliens that had been rejected by the Traveler; this was true at least for the Fallen. "You are the shield. The Ward allows you to bear the brunt of the impact, nothing more. You are the shield, and the light keeps you standing." "I have found that rarest treasure: a pragmatic Warlock." "A singer came to me, saying, 'You protect me, and I do nothing in return.' I told him to sing, and he understood." "He walked out into the demon light. But at the end he was brighter." "His Light cast no shadows." "Was there ever another Guardian so beloved by the people?" A Paean is a song of praise or thanksgiving. The Paean may be the song that Saint-14 mentions in one of his quotes. Saint-14's body drained from it's Light, found in the simulated future.